Historic church and grave yard with over 25 majestic stained glass windows, including 12 by Tiffany Studios. Trinity Church has served many people and many generations since 1746. From the time of its founding, the parish has been very much involved with the surrounding community. Over the years, Staunton mayors, city council members, and other community leaders have been parishioners. 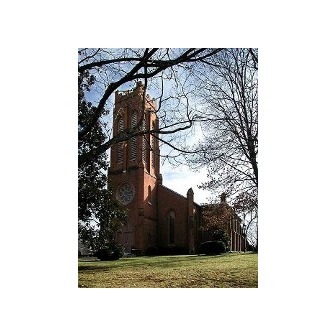 Trinity Church, the oldest church in Staunton and known for its first eighty years as "Augusta Parish," was founded in 1746, one year after Augusta County became an independent entity, and one year before the City of Staunton was established. (Augusta was the wife of Frederick, Prince of Wales, and mother of George III.) At their founding, the parish and county boundaries stretched from the Blue Ridge Mountains to the Mississippi River and from the northern border of North Carolina and Tennessee to the Great Lakes. As the Church of England (Episcopal) was the established church in Virginia (until after the American Revolution), the first vestry was elected as the leadership of both the parish and the county. Of its twelve members, at least nine were Presbyterians. Only one, John Madison, father of the first Bishop of Virginia, James Madison, was definitely a member of the Church of England. Services were held in the courthouse until the parish built its own church. In April 1747, the vestry elected the Reverend John Hindman the first rector. Land at the western edge of the city was purchased by the parish in 1750 from William Beverley. Three churches have been built on this site. The first brick building was completed in 1763, probably where the church tower is now located. The cornerstone of the second building was laid in 1830, using some of the brick from the first church. 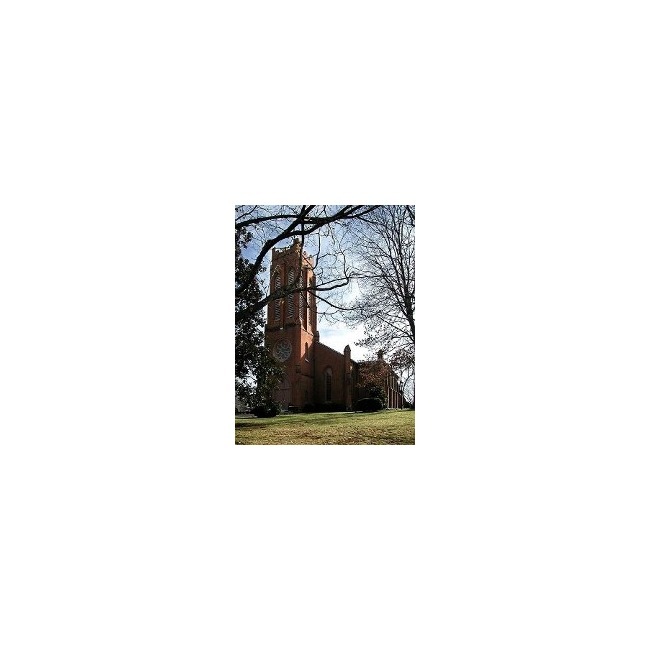 By this time, Augusta Parish had become known as "Trinity Church," although the two names remained interchangeable for a long time. The present building was constructed in 1855 and enlarged in 1870 when wings were added to the sides and the chancel was enlarged. In 1893 the massive brick columns and the three arches separating the nave from the chancel and side chapels were added. The chancel was greatly enhanced with the addition of the present brass altar rail, the walnut pulpit, and prayer desks; the nave and gallery were renovated; and carpeting and improved lighting (gas) were added. In 1907 the church interior was completely refinished. In 1923 the then-existing choir rooms were converted to the present Altar Guild sacristy and clergy vesting rooms, and the present choir vesting rooms were added. Further extensive exterior and interior renovation with repairs to correct moisture problems in the walls were accomplished in 1936, with repairs to the roof, gutters, downfalls, and underground drains, as well as replacement of a number of rotted beams under the church. In 1957 what started out as a plan to build a new organ in the gallery and to move the choir to the gallery ended up as a complete rebuilding of the interior of the church. Major changes were required to install a twenty ton organ in the gallery, and other structural repairs were necessary to correct water seepage and heating and electrical problems. The entire wooden floor had to be removed and replaced with a concrete one because of absence of proper footings and because of extensive termite damage. The rectory was built in 1872 and renovated in the early 1920s with the addition of a second bathroom and other miscellaneous repairs. Further renovations and repairs were done in 1939 and again in 1952. The parish house was also built in 1872, the first such structure in Virginia. It was enlarged and improved in 1924 and was given an extensive facelift in 1952. During the multi-building renovation completed in 2000, a new organ was installed in the church, along with new lighting, hardwood floors, air-conditioning, and replacement electrical and plumbing systems. The flat ceiling in the nave was removed, so that the interior now follows the exterior roofline. At the same time, the parish house was also renovated and enlarged, with the addition of a new kitchen, the refurbishment of classrooms, meeting spaces and offices, and the installation of central air-conditioning and an elevator. During the time the church building was closed during the renovations in the 1950s and the 1990s, services were held in the parish hall (now called "McCracken Hall"). Hours: In fall, winter and spring, the church is open from 1:00 to 4:00 pm, Monday through Friday. In summer, it is open from 1:00 - 4:00 pm, Monday - Thursday. If the front door is locked during visiting hours, please come to the Parish offices behind the church and we will let you in. The Trinity offices are open from 9:00 am - 5:00 pm Monday through Friday in the fall, winter and spring. In the summer, offices are open from 9:00 am - 5:00 pm Monday through Thursday and 9:00 am - 12:00 pm on Fridays.